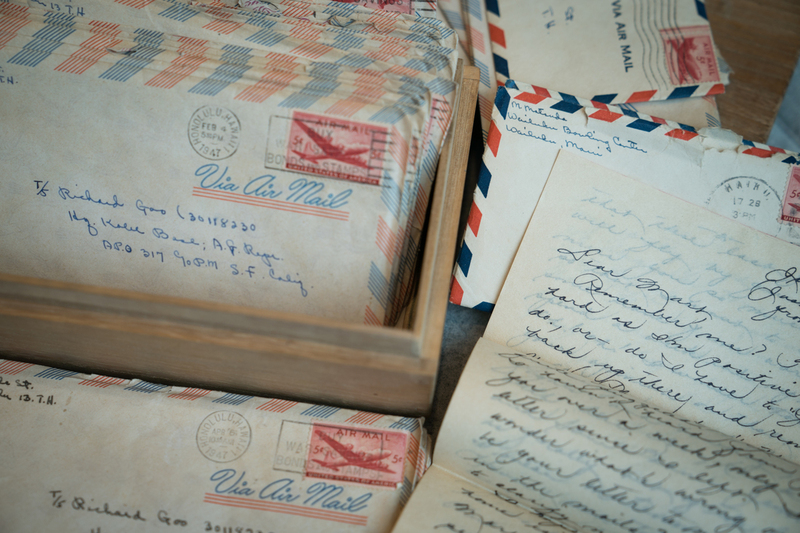 'Dear Dickie': A Window Into Family History Through Post-WWII Love Letters Sara Kehaulani Goo's father recently discovered the 28 letters, written from 1946 to 1947, stashed in a wooden box hidden at the bottom of a chest in her late grandparents' bedroom. Richard Goo, whose parents emigrated from China, was stationed in Japan as part of the U.S. occupation after World War II. "Dear Dickie," the woman wrote on thin parchment paper. "Here I am, so please don't scold me ..."
The Jan. 2, 1947, letter had made its journey from Honolulu to Kobe, Japan, courtesy of a 5-cent airmail stamp — evidence of an overseas courtship between two young people. She began with an apology for not writing sooner but quickly eased into flirting and teasing, anticipating the day when they would see each other again. The author —my grandmother Martha Kekauililani Matsuda — was just turning 20 years old and writing every other week for a year to a man stationed in Japan as part of the U.S. occupation after World War II. They would marry two years after these letters were written, and together, she and my grandfather Richard would raise eight children. My father recently found Grandma's letter and 27 others stashed inside a simple wooden box hidden at the bottom of a chest in my late grandparents' bedroom. Like many people who find old letters or beloved objects long forgotten, the discovery brought so much joy. But there was more: Not only did the letters provide a glimpse into our family's history, but they also shed light on our family's role in American history and offered insight into my own cultural identity, too. With each page, each loose shape of her cursive handwriting, I searched for details about my grandparents' earlier lives and the war they had just lived through. I hung on every endearing word she wrote to "Dickie," feeling the tingle on my arms as I tried not to tear the delicate pages. "Looks like you'll be on your way home soon," she wrote in another letter near the end of their pen pal exchange, which spanned one year, till the summer of 1947. "I can hardly wait for that day to arrive." Through her letters to him, my grandmother painted a lively picture of what it was like to be a young, carefree adult living in Honolulu after the war ended. She wrote of dancing at the armory with her sister and friends, leaving home at 9 p.m. and jitterbugging until her feet were tired. She and her friends — Kay, Flo, Ida and the rest of the "gang" — would cap off the night with a bite to eat at Kau Kau Korner, a drive-in diner in downtown Honolulu. Grandma wrote about the moonlight picnics at the beach where she and her friends would stay up all night until they saw the sun rise over the ocean. And of joyrides around the island with six friends piled into a Jeep 4x4. Letters that made the journey from Honolulu to Kobe, Japan, were evidence of an overseas courtship between two young people, Goo and Martha Kekauililani Matsuda. And then there was the bowling — so much writing about bowling that it seemed to be an obsession for her and her friends. I pictured them with their names stitched into their shirts — like in the movie Grease, but a Hawaiian version. And then I flashed back to my childhood and remembered the shiny bowling trophies, many of them taller than I was, lined up alongside the fireplace in my grandparents' home. Bowling, it turns out, not only spoke to an earlier era, but it was also evidence of their early romance and youth. Later, when they moved to Southern California to raise a young family, bowling became central to their social network, helping them build a new community of friends. Grandma's letters also provided glimpses of U.S. history beyond what I had learned in textbooks and popular biographies about presidents and generals. The less-documented, but more insightful lives were theirs; they were the people who actually lived in Hawaii during the Pearl Harbor attack, World War II and after. 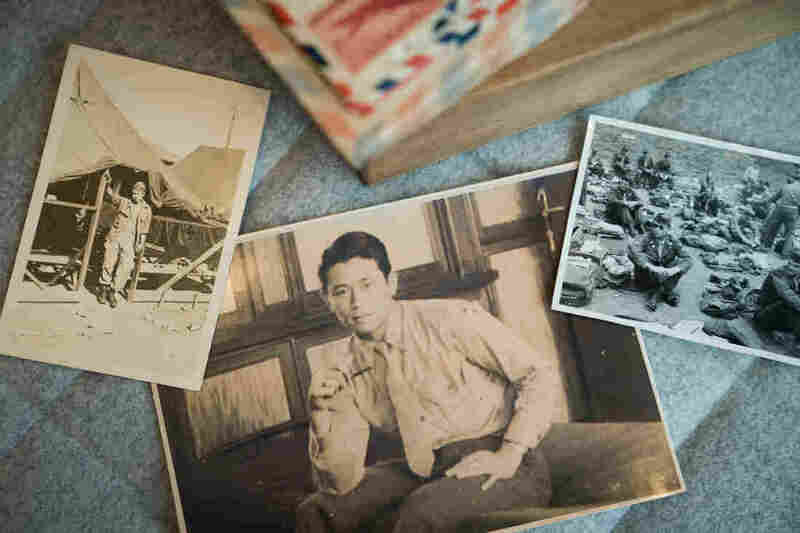 The letters offered a new window into how my grandparents — she of half-Japanese descent, half-Native Hawaiian, and he a Chinese-American — navigated a postwar world as they entered adulthood. Family lore was that my grandmother and her siblings were fearful that the U.S. government would send residents of Japanese descent to internment camps, as they did in California. So the story goes, the boys of the family decided to change their Japanese surname — Matsuda — to their mother's Hawaiian maiden name — Kahanu — just to be safe. Grandma confirmed this in one of her letters, when she wrote, almost in a passing reference, that one of her brothers was waiting to return to Maui until he could get "his name changed back." Nearly all my great-uncles served in World War II and were proud veterans. This fear, I also learned, co-existed with Grandma's self-consciousness about her own identity as an American who was a generation removed from her immigrant father's culture. "I wanted to see Japan but I don't think I'd like to see it now when the people are suffering," she wrote to Grandpa in September 1946, soon after he arrived there. From his own diaries and stories he told me, I know Grandpa saw Hiroshima firsthand as part of his duties, walking through the rubble of destruction. He wrote about the beggars on the street, the starving people who dressed in rags. "I don't think I could stand [seeing it], knowing all the time that I'm part Japanese," Grandma wrote. She also joked with my Grandpa — whose parents had emigrated from China — about how he was learning more of the Japanese language than she knew. "I hate to say this but it's time to say 'Aloha,' " she wrote at the end of one letter, dated April 23, 1947. "Beautiful word isn't it? I say 'hello' and 'goodbye' at the same time. Since I can't say it in Japanese like you do, I'm beginning to wonder who's Japanese, you or I?" I sat long into the night reading each of her letters. Then I carefully folded the brittle papers back to their original creases — the same ones my grandmother's hands made nearly 70 years ago. 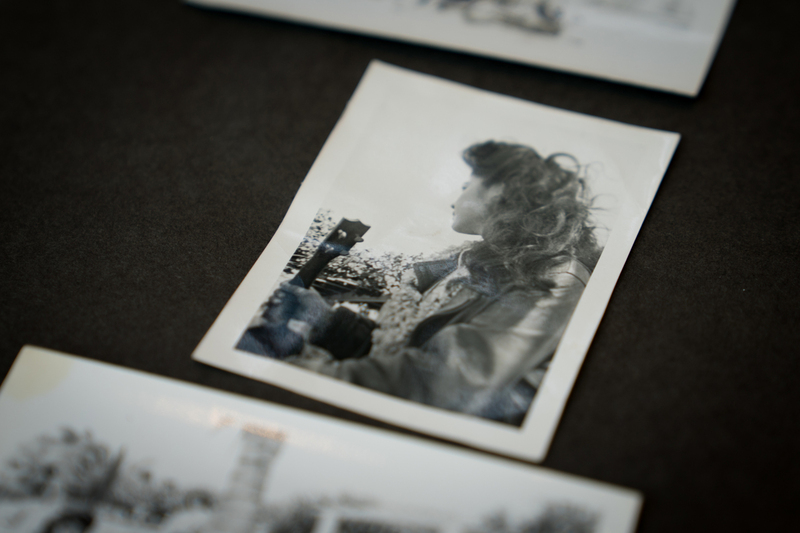 In a way, the letters reintroduced me to my grandmother, as she knew her 20-something self. Of the 28 letters we found, only one was written by my grandfather. We can only guess why more of his writings weren't preserved. "It's a shame. I don't know. But it was probably Grandpa who saved them," my father theorized. "He was more the sentimental one." Goo took this photo of Matsuda before they were married. They went on to raise eight children. I wonder whether my grandparents could have imagined that I would read these letters one day, that I would be able to peer into their young lives, their hopes, dreams and fears — to glimpse what living in that era was truly like. And I'm grateful. Family time capsules like these exist across America, some still waiting to be found in attics, closets, old trunks and basements, each preserving a special history. These are among the most precious gifts I ever could imagine one generation passing to another. We now count the letters among our family's most treasured possessions. In our case, they preserve not just the love and courtship between two people who met on the beach in Hawaii and corresponded across the Pacific, but offer an understanding of history we would have never known. Sara Kehaulani Goo (@sarakgoo) is interim managing editor of NPR Digital News.